China’s mobile payment market is more than 50 times bigger than that its US counterpart sitting at $5.5tn and is now being shaken up by its underdog Tencent, which is snatching market share from rival Alibaba. Alipay, which Alibaba launched in 2004 as a PayPal-type service to facilitate payments on its Taobao e-commerce platform, has long dominated China’s mobile payments. But its share of the market had fallen to nearly half by the end of last year while Tencent’s rose to more than a third – according to a report in the FT.
Alibaba had a 54% market share in the fourth quarter of 2016 compared with 71% in the third quarter of 2015, according to the latest data from consultancy Analysys. Tencent’s share rose to 37% against 16% in the comparable periods. 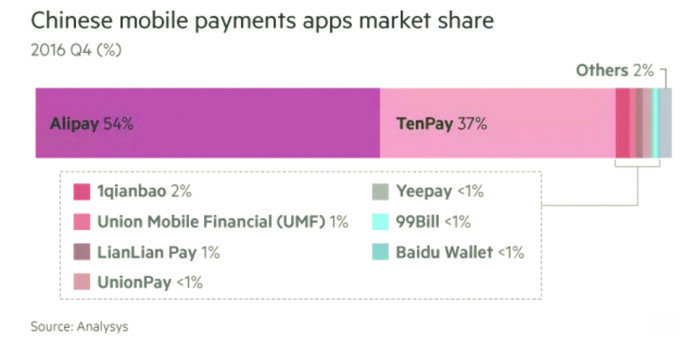 ApplePay, which launched in China early last year, did not feature in the top 10. China leads the world in mobile payments, buoyed by a boom in online shopping and the relative dearth of alternatives such as credit cards. iResearch said China’s mobile payments hit $5.5tn last year, 50 times the size of the US’s $112bn market, based on Forrester Research figures. Tencent, best known for its gaming and social media platform WeChat with 890m users, entered the arena a decade after Alibaba and for a year the two staged an expensive battle to attract customers. The battle for share in payments is less to do with profits — charges barely cover costs, according to one industry player — but in the value of the data gathered from spending habits and financial information. Industry consultants attribute Tencent’s rise to the pervasive use of WeChat and merchants’ desire to avoid relying on one provider. “The dominance of the Taobao and T-Mall ecommerce platforms initially helped make Alipay the default digital wallet in China,” said Jeff Galvin, partner at McKinsey in Hong Kong.